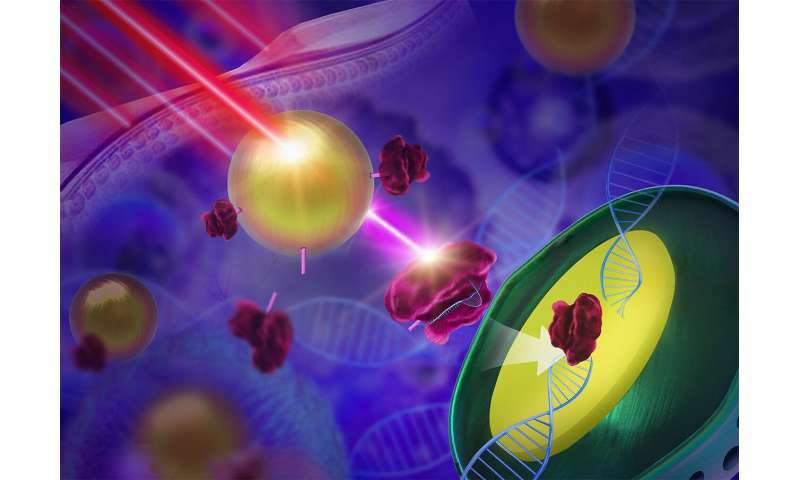 A team of researchers from Nanjing and Xiamen Universities in China has developed an alternative to using viruses to transport CRISPR-Cas9 gene editing tools into a desired cell—and it involves two types of light. In their paper published in the journal Science Advances, the group describes their new type of carrier and how well it worked with test mice. CRISPR-Cas9 gene editing tools are a coming revolution in treating genetic conditions, and scientists continue to test their abilities in a variety of applications. One area of study has involved looking for a replacement carrier system—the current approach uses a virus to carry the gene editing tool into a particular cell. Early on, researchers knew that the virus approach was not viable because of possible responses from the immune system, or worse, the threat of initiating tumors. In this new effort, the team in China has come up with an entirely new way to deliver the gene editing tool using two kinds of light. Their carrier system consists of nanoparticles that are sensitive to low-energy near-infrared radiation (NIR) and that emit UV light. When NIR is shone on the nanoparticles, the light is absorbed and converted to UV light, which is emitted. Inside of a cell, the package is activated by shining NIR onto the skin, where it penetrates into the body and makes its way to the gene editing tool. When the NIR is converted to UV light, it cuts molecules in the carrier package, releasing the gene editing tool to do its work. In practice, a CRISPR-Cas9 tool was delivered directly by the team to a cancer tumor inside of a mouse via injection. When it was safely in place, the researchers shone NIR on the skin covering the location where the tumor (and gene editing tool) was located. When UV light released the package, it went to work editing a protein that allowed a tumor to grow—the end result was a reduction in tumor size. The researchers suggest their work shows not only that a light-based carrier can work with CRISPR-Cas9 gene editing, but that it can do so safely and with direct benefits.